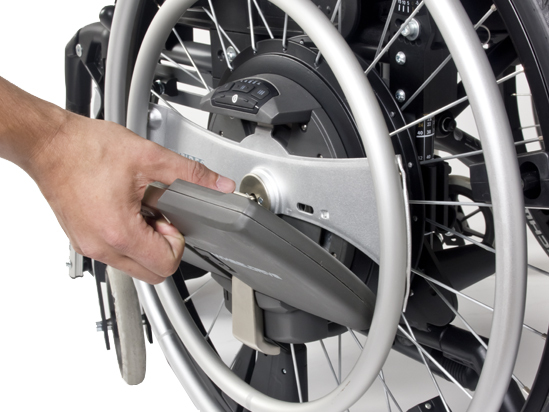 The innovative WheelDrive power assist is designed to make propelling your wheelchair easier, in every situation. And it also offers therapeutic benefits. 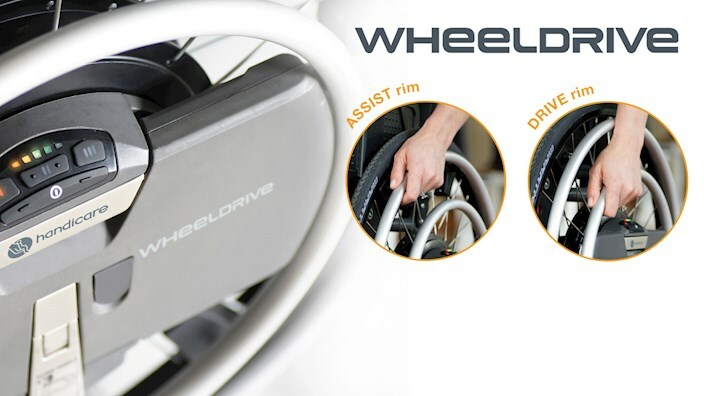 Due to its unique dual rim concept, WheelDrive not only gives power assistance while self-propelling your wheelchair, it also allows for continues drive. Going out further, negotiating challenging roads or thresholds, or maneuvering in tight spaces? You simply choose the support you need to move effortlessly. 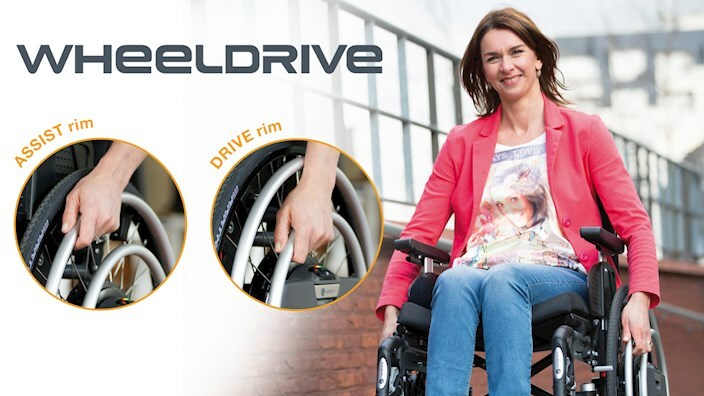 With WheelDrive you will enjoy enhanced mobility and freedom, and stay active - in your own wheelchair! Who will benefit from Wheeldrive ? Do you experience arm or shoulder pain, or a decrease in strength? Does your energy level fluctuate a lot during the day? Or is it just too demanding to propel your wheelchair all the time? Then you can benefit greatly from the WheelDrive power assist. However, WheelDrive is also a great solution if you are physically fit and simply want to go further. Please note that single-hand operation and foot-propelling are not compatible with WheelDrive. In case of decreasing cognitive capacities or spasms the use of WheelDrive is advised against. WheelDrive features a unique dual rim concept. The large ‘assist rim’ provides extra power assistance while self-propelling. Choose from three support levels, each with their own specific driving characteristics. The small ‘drive rim’ gives you continuous drive at three speed levels - like a 'joystick on the wheel', no effort required. Naturally, switching between both rims is easy. So you always get exactly the support you need! 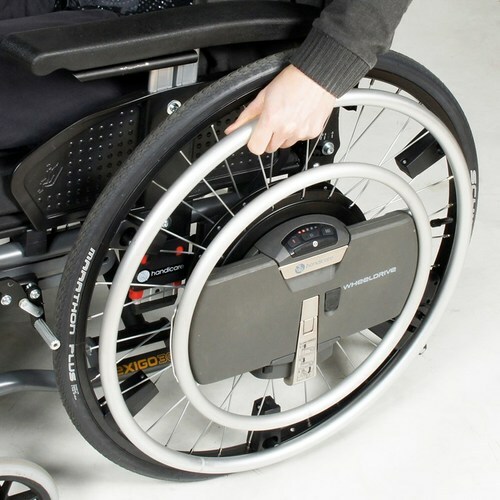 Using your wheelchair with WheelDrive wheels feels very natural - it is very much like regular self-propelling. You can easily switch the system on and off. 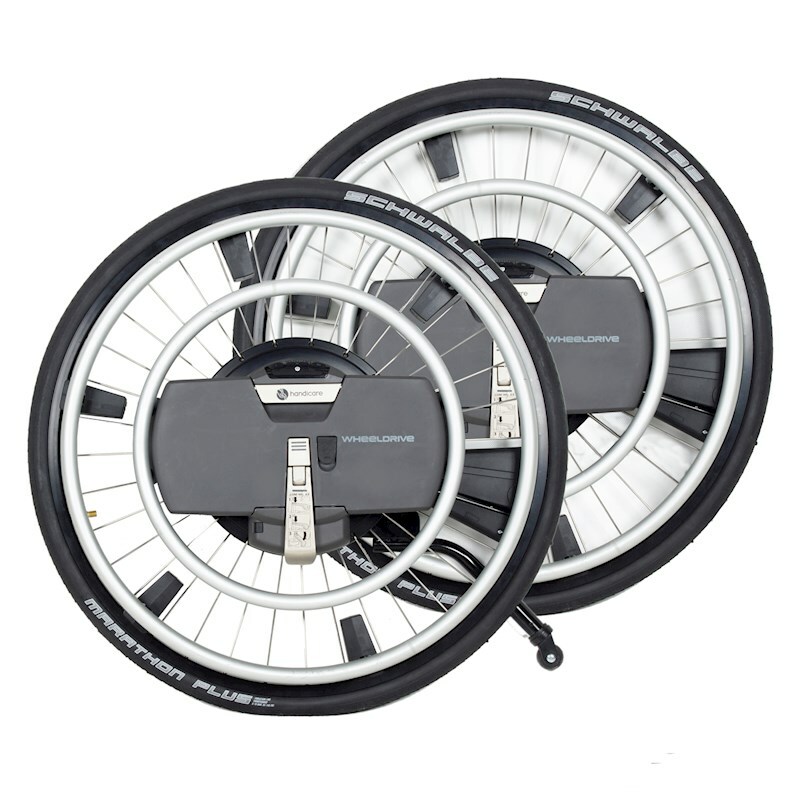 Determine the level of support or speed you want and you will soon find how easy it is to switch between both rims. The top speed is 10 km/h (assist rim) / 6 km/h (drive rim). When driving down a slope, the motors will brake automatically - for maximum safety and security. WheelDrive enables you to just go out there on your own. Going further or driving on challenging surfaces and slopes? It will simply require much less effort. This also goes for manoeuvring in tight spaces. And when you are travelling by car, the wheels can be quickly removed from your chair for easy transport. 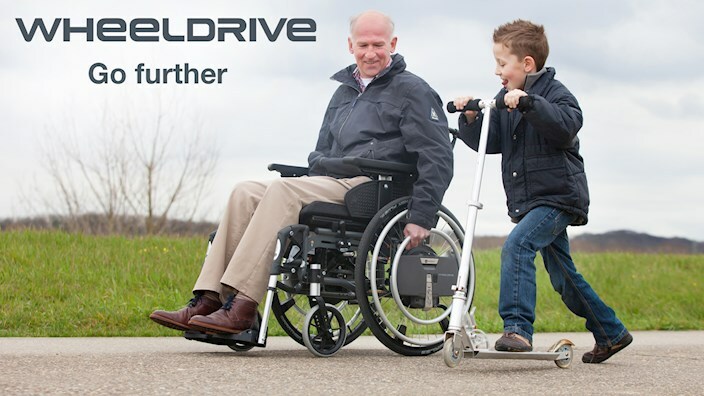 With WheelDrive you will experience enhanced mobility and have more energy to enjoy an active life. After prolonged manual wheelchair use, you can experience arm pain and shoulder pain or a decrease in strength. WheelDrive reduces the strain on muscles and joints, and helps to prevent these problems. At the same time, active mobility or exercise is stimulated, allowing you to stay active and independent. The WheelDrive wheels can be easily mounted on virtually any manual wheelchair model, without any additional parts or changes to the wheelchair. 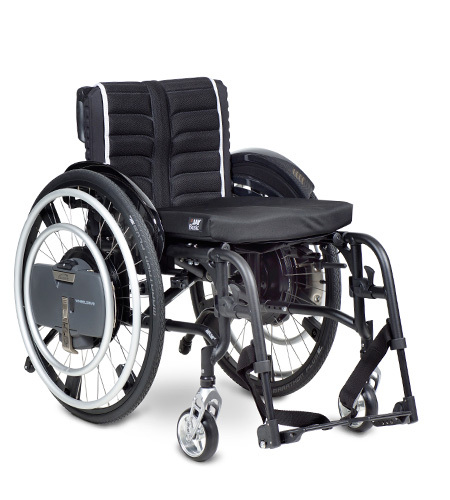 So you can continue to use your own chair, customized to fit your specific needs. And you can swap back to the original manual wheels as an alternative at any time - no tools required. Price from £4,495.00 Please contact our customer services team on 01642 805050 or enq@activemobility for further information.